Data-direct-I/O-technology-brief.pdf Data center bandwidth requirements continue to rise, driven by growth in server virtualization, unified data and storage networking, and other bandwidth-intensive applications. Many IT organizations are deploying 10 Gigabit Ethernet (10 GbE) to meet these increasing needs. While 10 GbE provides greater, more cost-effective bandwidth, it also places a greater ...burden on server resources. This is a result of architecture and design decisions made when I/O was slower and processor caches were small. For that environment, it was reasonable for systems to be designed in such a way that the main memory was the primary destination and source of I/O data rather than the scarce resource of cache. This resulted in I/O data transfers requiring many “forced” trips to the memory subsystem for data consumed and delivered by I/O devices. It also kept the cache free of I/O data not currently needed by the CPU. These trips loaded the memory subsystem up to five times the link speeds, forcing the CPU and the I/O subsystem to run slower and consume more power. The environment has changed; the Intel® Xeon® processor E5 product family supports up to20 MB last-level cache, so cache resources are no longer scarce. With Intel® Data Direct I/O Technology (Intel DDIO), Intel has updated the architecture of the Intel® Xeon® processor to remove the inefficiencies of the classic model by enabling direct communication between Intel® Ethernet controllers and adapters and host processor cache. Eliminating the frequent visits to main memory present in the classic model reduces power consumption, provides greater I/O bandwidth scalability, and lowers latency. Intel® DDIO is a platform technology that enables I/O data transfers that require far fewer trips to memory (nearly zero in the most optimal scenarios). In doing so, Intel DDIO significantly boosts performance (higher throughput, lower CPU usage, and lower latency), and lowers power. 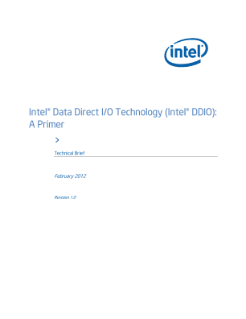 Read the full Intel® Data Direct I/O Technology (Intel® DDIO) technology brief.